For many of us, noise removal is one of those forgotten adjustments in our everyday workflow. In part, that's because camera manufacturers have improved the high ISO pictures that appear on our screen. But that doesn't mean we still don't need it at times. 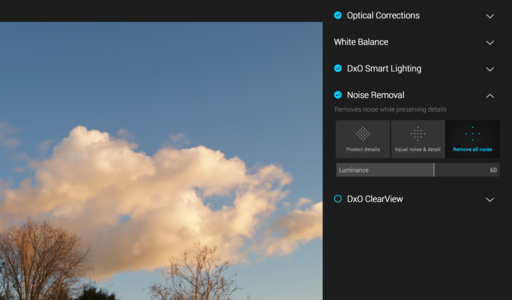 Noise Reduction in the DxO OpticsPro for Photos editing extension. But what I've noticed is, that if "I just play around with noise reduction" on an image, especially one with continuous tones at a higher ISO, I usually like the results. Looking at the screen, I'll say to myself, "Hmm, that looks better." So I try to remember to at least take a look at noise reduction every now and then with these types of shots. There's a NR slider in most of our image editing apps. Lightroom, Capture One Pro, and Photos for macOS all have this functionality. But I've noticed that their algorithms vary widely. The noise reduction tool in Luminar. Even though Lightroom and Capture One have good built-in tools, I find myself working with plugins more often for my NR work. For example, I really like the noise reduction tool in Luminar. Typically, I use it as an editing extension for Photos for macOS or as a plugin for Lightroom because it's so convenient and doesn't disrupt the workflow. 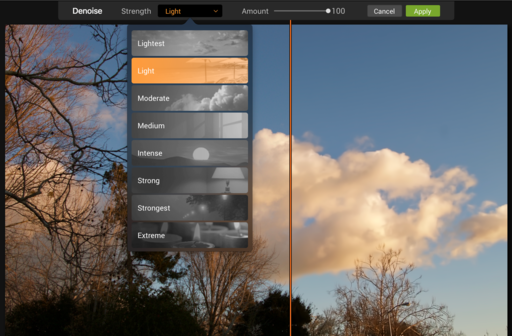 For one-click convenience that are also effective, I like the DxO OpticsPro for Photos editing extension. There's a good article on Amateur Photographer titled, What's the best noise reduction software out there?. They survey a number of apps that work on both Mac and Windows machines, and rate them. Chances are that you have one or more of these on your computer right now. You might want to pay it a visit every now and then. I think you'll be happy with the results.